If you love taking photos, you know the frustrations of spending time photographing what you expect to be fabulous images, only to find many of them are out of Focus. It happens to the best photographers. Rather than throw your hands up in despair and hitting the delete button, save some of your out-of-focus images for new purposes. For this week’s WordPress photo challenge, let me use this opportunity to share some ideas for using those fuzzy images. If you have read my book Better Blogging with Photography, you know I am a staunch advocate for folks taking and using their OWN images, whether it’s using a fancy camera, a point-and-shoot digital or a mobile phone. The beauty of digital images is they can be deleted if needed or edited for perhaps a second life! I came across this beautiful scene, with the sun back-lighting the spring trees, and shot several images. In my example here, you can see that the first shot was out of focus. Funny how the eye sees one thing and the lens sees something else. This shot is unorganized and chaotic, with competing spaces of both focused and out-of-focused subjects. But it demonstrates the example of motivation to continue taking more pics! I got closer and changed views, continuing to take the images from different points of view, resulting in this image below. In this view you can see that I used the unfocused portion and added the quotation. 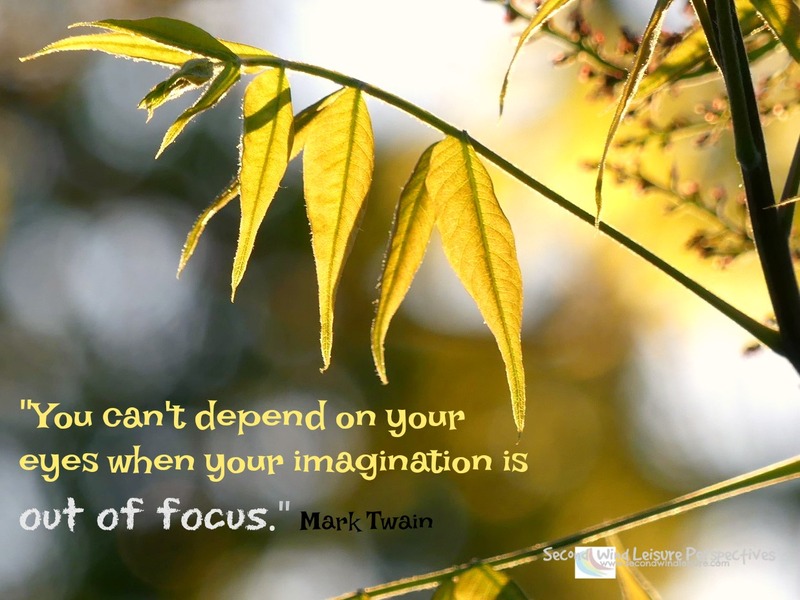 The quote by Mark Twain seems to lend itself well to the image. 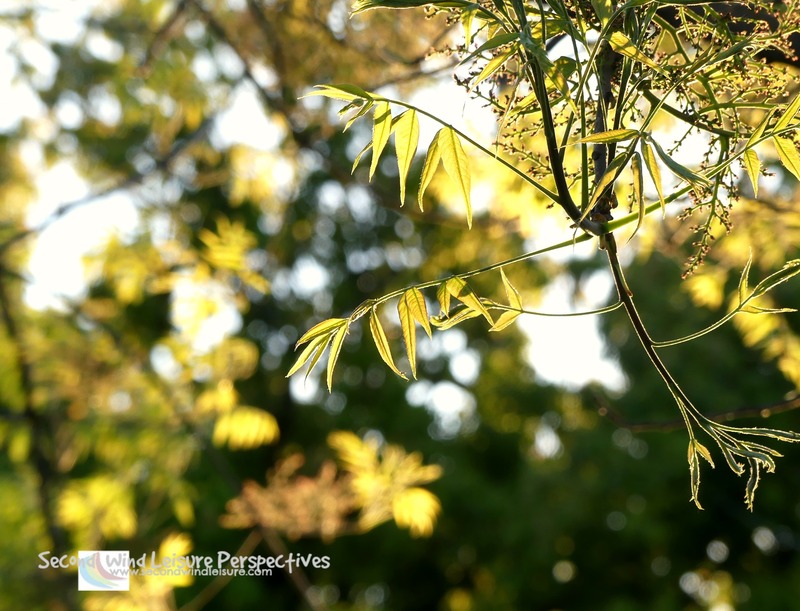 “What other ways can I use unfocused images?” you ask…well, let me count the ways. Use them in your blog’s header with your blog’s title as the overlay. If you notice the header on my blog is a fuzzy image of the hummingbirds. 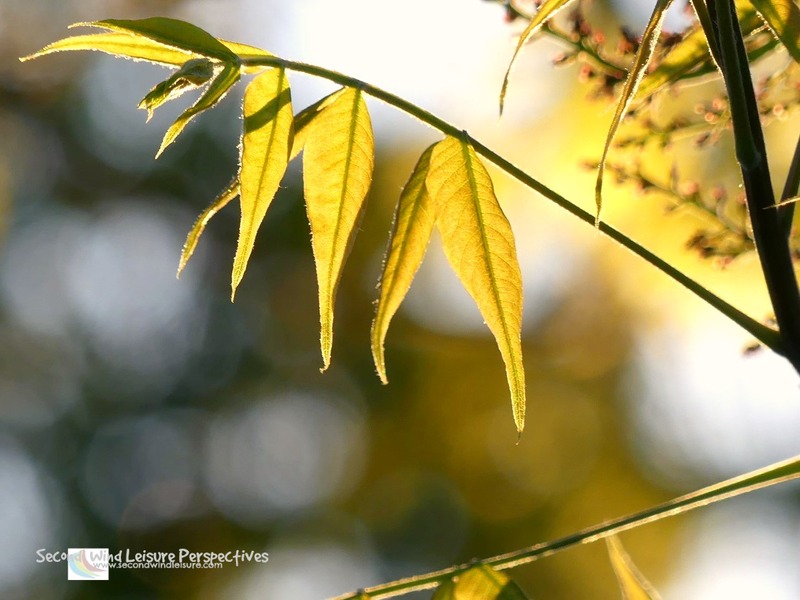 Use an out-of focus image for your blog/website’s background image. Here, sharpness is over-rated. Perhaps you want to use images of people, like friends or family members, but don’t want their identities known. A blurry image still makes a great image, again, to tell your story. This can also be achieved in your post editing using PicMonkey, Canva, or Photoshop. If you’re crafty, print them out and these soft images make great backgrounds for all kinds of DIY projects like cards, scrap-booking paper, stationery, etc. Do you use PowerPoint slides for your work or business? Instead of using the limited choices of online themes, make your own slide backgrounds. For that matter, using out of focus images on your sides will still provide effective visuals. Even PowerPoint slides and Prezi presentations have copyright limitations…creative commons rules apply here, too. If your slides appear online or are published in any format, it is always best to use your own images. These same unfocused images can be used as backgrounds for blog post images (see my featured image with the light bulb). They look great on any digital social networking sites like Pinterest, Instagram and Facebook.They also are effective when sharing in link parties. And if you are an author looking for book cover ideas, an unfocused background image may be just the ticket to create the mood you are looking for! And you are still allowed to throw some away. All this being said, if you are in a hurry and need some FREE photos for your blog or website, check out my page FREE Photos for Your Blog. I’ve curated hundreds of my own photos I am not using for use by anyone! 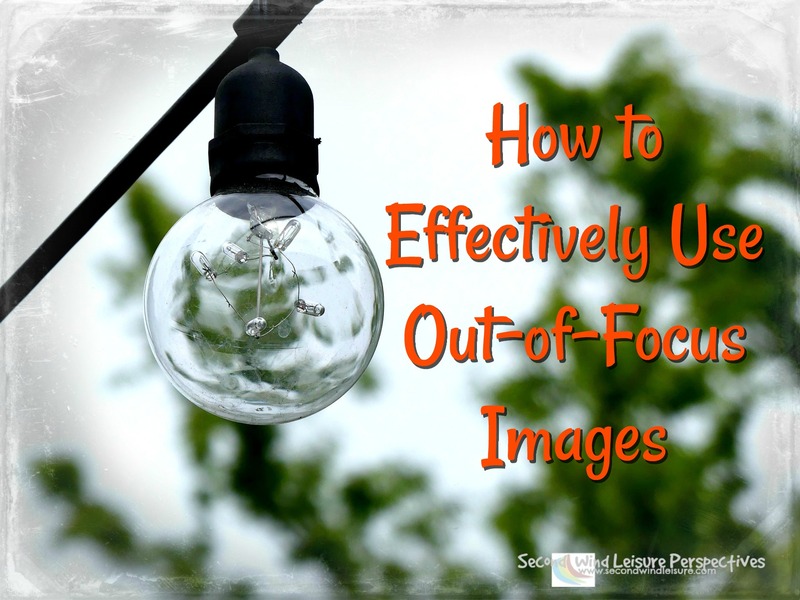 Can you think of any other ways you can use unfocused images? I would love to read your ideas in the comments! I love your examples. I have made similar use of some of my less than perfect photos, and it’s a creative challenge. Quite a few of them are blurry, but I keep them if they have any potential at all. Some have even been used in photo challenges that asked for an out-of-focus image. Thanks for compliment and the info! Great idea, but the first image was not necessarily out of focus. This is called shallow depth of field in that you or your camera metered off the subject (The branch and leaves) and not the whole image. Typical of camera phones and rangefinder point and shoot cameras. By using a smaller aperture, the background would have been sharper…if this is what is desired. Easier to do with a camera that allows for control of aperture and shutter speed. the digital world, Dslr cameras specifically, the quality of unfocused areas of an image is referred to as, “Bokeh.” Inexpensive auxiliary lenses are notorious for bad bokeh, and camera phones provide the same if not worse bokeh. Now the good news. Bokeh is not really a bad thing. If you take a lot of photo with your phone and you want to intentionally distort the background, compose the photo the way that is pleasant to you. Tap on the screen to adjust focus and exposure. Then swipe zoom until the background is blurred to your liking. If you want the foreground to be out of focus, tap on the subject, as well as darker areas in the image, and the foreground will go out of focus. Be sure to fire when the desired affect happens. Thanks, Karen! Some helpful hints from the pro that you are is awesome! Thanks for these great tips, Terri! I can’t wait to try them out! I’m pinning this Terri as it is such a helpful post. I don’t have confidence in my photography and yes I do have quite a few blurry ones that I delete. I loved the way you used your image to make a quote it looks so professional and proves we can use our own photos. Thanks for the inspiration and have a beautiful day. Some great ideas for using out of focus pics. I get attached to them and don’t want to delete them because I know I will need them later…and would rather have them than not. Thank you, I know how you feel about being attached to them, funny, huh? I’ve moved mine to an “unfocused” folder for future reference and some just had to go! I know! I still have several unfocused hummers, but I’m holding out for a miracle of technology, LOL! I’ve got a very inexpensive Cannon Sure Shot that takes great photos of my hummies. I love them! You are welcome, thanks for your lovely comment! Sometimes the focal point is obviously on the tree behind the face—ha ha!! But sometimes, if I crop out the person, it could work for other things…I just don’t always think that way!! Some very interesting ideas here, Terri. I mainly photograph food so I really try to ensure the pictures are in focus but I have my moments of disaster.